How the presidential candidates think and how their thinking style mixes and matches with voters' own thinking styles – combined with what might be best for the country – can help voters in the decision-making process. 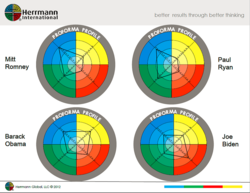 Herrmann International and Dr. Judy Kuriansky recently evaluated the major party candidates' thinking styles. From President Obama’s recent display of both decisive action and compassion in New Jersey to Governor Romney’s shifting his campaign plans to help pack emergency relief boxes, while also reminding voters of the administration’s poor record on jobs, Superstorm Sandy has provided a real-life opportunity to see the presidential candidates respond in a crisis situation. While it’s still yet to be determined how they will approach handling the country’s critical issues — unemployment, health care and international relations — voters can uncover some clues by analyzing the candidates' thinking styles. The logician (left): Prefers facts, analysis, and being correct, consistent with professions like lawyers, bankers, doctors and scientists. These voters prefer candidates with successful financial judgment and business experience who can balance the budget and get the facts right. They respond to words like “think” and “the facts prove.” Romney’s emphasis of his business experience would appeal, but fact-checking questions could detract. The safekeeper (left): Risk-averse, tending to stick to strict plans, agendas, and regulations, consistent with jobs chosen by accountants and supervisors. Safekeepers seek low-risk, time-tested plans that assure safety and security, conservative spending, and a track record of proof. Obama’s getting bin Laden wins big for safety, but the confusion around Benghazi poses threat. The communicator (right): Appreciates expression, compassion, and relationships, seen in the activities of caretakers, teachers and therapists. Communicators (more often women, according to data) prefer emotional connection and compassion. Thus, they may respond to the perception of Obama as caring, suggested by his embrace of the term Obamacare, and also may have warmed to Romney’s recent (likely coached) more personable presentation and feeling-based word choices in the debates. The visionary (right): Prefers innovation, imagination, and conceptual ideas, appealing to artists and consultants. These voters are intrigued by change, get excited about what’s “new,” and look towards the future. Here, Romney’s promise of jobs and economic growth are tempting while Obama’s campaign slogan of “forward” can appeal, though his “hope and change” message of 2008 was more strongly associated with this style. What the styles reveal are natural preferences and mental “defaults,” but regardless of these preferences, everyone has the ability to tap into the other skills when necessary. So how do the two major party tickets think? The four thinking styles yield an HBDI® Profile based on answers to a psychometric questionnaire, but for purposes of this analysis, Herrmann International researchers conducted a hypothetical rating (called a “proforma” profile) of the data of Barack Obama and Mitt Romney, and their respective running mates, Joe Biden and Paul Ryan. Governor Romney is highly loaded in the logician and safekeeping styles, consistent with business and analytic skills demanded to turn around companies and run the Olympics, but people may matter less in the process. Representative Ryan’s profile is very similar to Romney’s. With two similar candidates on the ticket, other staff would need to fill in the advantages of their least preferred preferences. President Obama has the highest visionary score of all candidates. His scores also strike a balance between vision, logician and communicator, while safekeeping is his least preferred. Vice President Biden’s score as a communicator is predominant, consistent with his self-admitted shoot-from-the-hip expression in real life. Another set of HBDI® profiles of computer-generated scores based on what Obama and Romney said in the debates revealed very little difference between the candidates' profiles, supporting the widely held notion that all have been coached to situationally adapt their styles, carefully selecting words, clothes, and even body language to appeal to various constituencies. Because this makes it harder for voters to make their decisions in a clear-minded fashion, the hypothetical model above can help ferret out true tendencies in the midst of media-projected images. Since “birds of a feather flock together,” voters may favor the team that flows smoothly with their own, but opposites also attract. A voter may decide to go with a headstrong candidate to overcompensate for his/her own lack of assertion, for example, or someone who tends to come up with “crazy” ideas may want to be tempered with a more steady, even rigid, personality. No style is “good” or “bad;” instead, they matter in terms of their appeal to voters, how the strengths of the style manifest on the job, and that the less-preferred styles are mobilized when needed, either by personally adapting to the situation or getting the alternate perspective from others in their circle. Based on Herrmann International data, the U.S. public as an aggregate is fairly balanced across all four quadrants, suggesting that voters have a need for all four styles — fact-checking, safekeeping, and proof as well as compassion and hope for a better future. Dr Judy Kuriansky is an internationally known clinical psychology affiliated with Columbia University Teachers College, an honorary professor at Beijing Health Science Center in China, and an NGO representative at the United Nation., Her many books include ‘The Complete Idiots Guide to a Healthy Relationship”and “Beyond Bullets and Bombs: Grassroots peacebuilding between Israelis and Palestinians.” and the recently released “Living in an Environmentally Traumatized World: Healing Ourselves and our Planet”(Praeger, 2012). http://www.DrJudy.com.